Over the course of an NHL playing and assistant coaching career that spanned parts of five different decades (1979-80 to 2010-11), Brad McCrimmon had two driving ambitions: He wanted to become a valuable defenseman on Stanley Cup-caliber teams, and he wanted to someday become an NHL head coach. On the first front, McCrimmon succeeded in a major way. He was taking an important step toward pursuing the second goal when he died in a tragic plane crash in Yaroslavl, Russia, that claimed the lives of the entire Lokomotiv Yaroslavl team. The 52-year-old McCrimmon was set to make his professional head coaching debut for Lokomotiv when it was to travel to Belarus for the opening game of the 2011-12 KHL regular season. The plane crashed moments after takeoff. A veteran of 18 NHL seasons that saw him play in 1,222 regular season games, “The Beast” was a vital defender on two Philadelphia Flyers teams (1984-85 and 1986-87) that reached the Stanley Cup Final, as well as a Calgary Flames club that won the Cup in 1988-89. In all, the Saskatchewan native collected 81 goals, 322 assists and 1,416 penalty minutes in the regular season, while dressing in 111 playoff games and scoring 11 goals and 29 points. He played three seasons with the Boston Bruins, five with the Flyers, three with Calgary, three with the Detroit Red Wings, three with the Hartford Whalers and one with the Phoenix Coyotes. A standout two-way defenseman for the WHL’s Brandon Wheat Kings, McCrimmon combined a sizeable mean streak with defensive positional savvy and even occasional offensive flair. He posted 24 goals and 98 points in 1978-79 for a Brandon team that posted a 58-5-9 record. Among his Brandon teammates was another player who went on to have a major impact on the Flyers of the 1980s – left winger Brian Propp. Boston selected McCrimmon in the first round, 15th overall, in the landmark 1979 NHL Draft. He had a strong second NHL season in 1980-81, scoring 11 goals a nd 29 points, while posting a plus-minus rating of plus-27 and 147 penalty minutes. After a somewhat subpar follow-up campaign, Boston traded him to the Flyers in exchange for goaltender Pete Peeters. The trade helped both sides. The Flyers had goaltender Pelle Lindbergh waiting in the wings, but were in need of improvement on the blueline. Peeters went on to win the Vezina Trophy as the NHL’s best goaltender in 1982-83, while McCrimmon stepped in and helped solidify Philadelphia’s defense. More than any other teammate, McCrimmon’s career was most often associated with his partnership with Hockey Hall of Fame inductee Mark Howe. 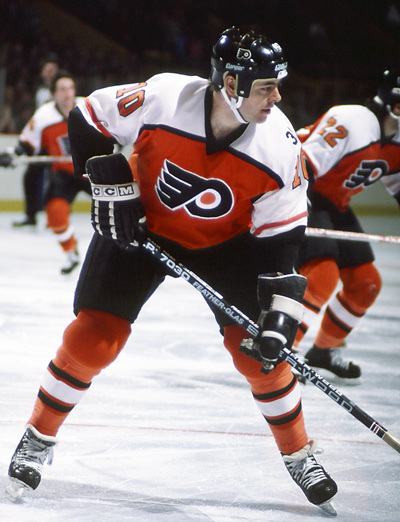 The two were paired in McCrimmon’s third season in Philadelphia, and remained together for the duration of the Beast’s time with the Flyers. The Howe-McCrimmon partnership was the glue that held together the Mike Keenan era Flyers teams of the mid-1980s. In 1984-85, McCrimmon posted 43 points and a plus-52 rating for a Philadelphia team that shocked the hockey world by posting the best regular season record in the NHL and going on to Stanley Cup Final. Unfortunately, McCrimmon suffered a shoulder injury in the playoffs that knocked him out of the Final. The next year, McCrimmon and Howe combined to have one of the best seasons posted by any defensive pairing in NHL history. Howe racked up 24 goals, 82 points a plus-85 rating, while McCrimmon compiled 13 goals, 56 points and a plus-83 rating. Incredibly, none of the Flyers’ other defensemen finished on the plus side of the ledger that season (Brad Marsh was even, the rest were minus-rated). The 1986-87 season proved to be the final year of the Howe-McCrimmon pairing. On a club that took the Edmonton Oilers to Game 7 of the Stanley Cup Final, Howe posted 15 goals, 58 points in just 69 regular season games and a plus-57 rating while McCrimmon chipped in 10 goals, 39 points and a plus-45 rating. As a result of a contract dispute after the 1986-87 season, the Flyers traded McCrimmon to Calgary in exchange for a 1989 1st-round draft pick (later transferred to Toronto; Steve Bancroft) and a 1988 3rd-round pick (Dominic Roussel). The move worked out extremely well for the Flames and McCrimmon. In his first season with the Flames, McCrimmon compiled 42 points and a plus-48 rating. The next season, he racked up a plus-43 rating and, more importantly, started 22 playoff games en route to getting his name etched on the Stanley Cup. After moving on from Calgary to Detroit in the summer of 1990, McCrimmon was part of the Red Wings’ resurgence that saw the club steadily climb back among the ranks of Stanley Cup contenders. In 1991-92, McCrimmon posted a plus-39 rating and 29 points. The following season, he was reunited as teammates with Howe (who had signed as a free agent with Detroit after 10 years with the Flyers). The two did not play together regularly, but were paired up on occasion. That year, McCrimmon posted a plus-21 rating in just 61 games. Howe and McCrimmon continued their friendship after McCrimmon moved on to finish up his NHL career as a part-time player in Hartford and Phoenix. After retiring an active player after the 1994-95 season, Howe became a scout for the Red Wings. McCrimmon served as an NHL assistant coach from 1997-98 to 2010-11, save for two seasons (1998-99 and 1990-2000) as the head coach of the WHL’s Saskatoon Blades. McCrimmon was an assistant coach with the New York Islanders (1997-98 to 1998-99), Calgary Flames (2000-01 to 2002-03), Atlanta Thrashers (2003-04 to 2007-08) and Red Wings (2008-09). Throughout his NHL assistant coaching career, McCrimmon aspired to someday become an NHL head coach. Therefore, when the chance presented itself after last season to take on the head coaching job of Lokomotiv Yaroslavl, he could not resist. Tragically, McCrimmon and the rest of the Lokomotiv team perished in a plane crash on the eve of the 2011-12 regular season. The news has rocked the entire hockey world. McCrimmon is survived by his wife, Maureen, daughter Carlin and son Liam.